Imagine you can travel through time. Backwards and Forwards. What would you do? Go back into history to change the present? Get rich using knowledge of the future? 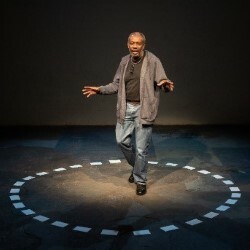 Written by Tim Etchells and powerfully performed by Tyrone Huggins, To Move In Time is an unfurling trail of thought in which extraordinary and impossible fantasies are dreamt up, lived out and then discarded. An obsessive stream of consciousness, tangled and contradictory, the work combines Etchells' text with Huggins' powerful performance to walk a line between comic absurdity and melancholia.